Create your own perfect world! Party Destination Grid is 3D social virtual world. The system is running on state of the art high performance technology. OpenSimulator is the leading open source software for the multi-grid-platform. The grid is free to join. For the community donations are greatly appreciated. People can enjoy the community and older members will provide assistance to the newer ones. People can explore the Party Destination Grid, socialize, participate in groups activities and create or trade services with other users. Let yourself be a part of our virtual life. So please do invite all your friends to join Party Destination Grid. Besides the normal daily routine members will be able to join parties, participate in contests, win award, find freebieplaces and more. The Party Destination Grid allows gaming, gambling and camping, if the users create and use such content. Party Destination Grid starting to be adult grid. Thats why child avatars are not allowed on mature or PG and adult region. Because mature, PG or adult regions will often contain sexual content, child avatars should not visiting Party Destination Grid. If in any case a child avatar does teleport in from a different grid to Party Destination Grid, they will be advised to return in adult form and/ or asked to leave until they appear in that form as an adult. They may also while visiting the grid stay in that form at all times. But in totaly disregard rules Elite Team we will be forced to ban for all our server. In grid all members created harmony and if you see it in you are cordially invited. Members can also create their creation and share it with other members. The beginning of something remarkable! 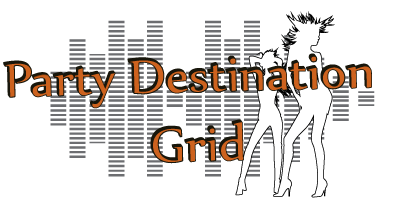 In Party Destination Grid every day is fun in many regions. For all members is this unforgettable experience and they want to fell it every day. Get place for your imagination! Are you a creator? Party Destination Grid offers creators free store rentals to help you get started! Want to your own region? Full Regions are only 20€ or 27US$. Party Destination Grid offers home rentals in an upscale beach community called "White Sands" each home is unique and set on it's own parcel giving you the rights to control media and privacy. Party Destination Grid reach one more record ! We are Tillia company which is engaged in the 3D virtual world. Headquartered is in Slovenia, as well as all of our servers. We offer a wide range of services from virtual worlds with excellent quality. Keeping up with the Sked Grabber - Director and team leader with 12 years experience in virtual worlds, working for different companies worldwide in various industries. We are a team of artists who share the same passion for 3D art, socializing and creating new better environment for socializing. "We're small but we are mighty." We are trained to create high-quality service. We appreciate the long-term cooperation, responsive communication and mutual understanding. Copyright © 2014 - 2018 Party Destination Grid. All Rights Reserved.